How do you recognize the expert traffic management service in Los Angeles? Look for the signs. These signs are simple to spot when Roadway Construction Service (RCS) is involved. We have hundreds of traffic control signs in our inventory, covering every conceivable need. No question about it. Signage plays a critical role in traffic control preparations, particularly in population/traffic-dense sprawls such as Los Angeles and Orange County. Signs provide the warnings, guidance, and direction critical to safety, smooth traffic flow, and efficiency. Without them, projects would come to a grinding halt. Even one gap in signage will create costly delays. Fortunately, delays are never an issue thanks the vast RCS sign inventory. We have the right traffic control sign for every need and situation. Because of their importance, traffic control signs are integral to traffic control planning. As needs are defined, appropriate signage must be selected and incorporated into the overall strategy. The comprehensive RCS sign inventory greatly simplifies and expedites this process. 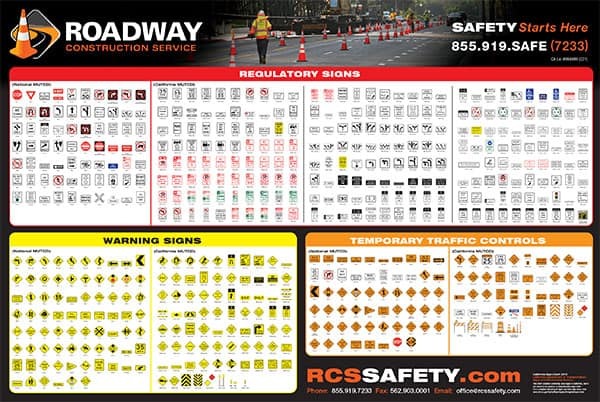 RCS has created a sign chart poster that displays commonly used traffic control signs in California, each group clearly categorized for easy reference. These posters are available at no charge to interested parties. Simply ask your RCS sales rep for your complimentary wall chart. 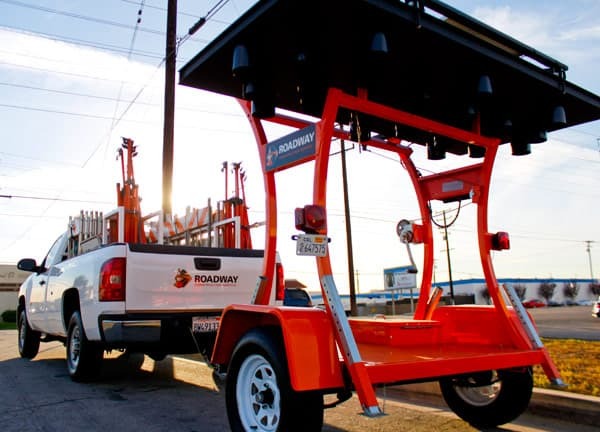 RCS is ready to help with all of your Los Angeles traffic control needs. Whether you require basic signage for a small, one-day job or comprehensive traffic control services for a project that will last weeks, our expert traffic management technicians and crew will make sure you’re always on the road to success.